Gary Johnson (top) handles a horse inside the arena he helped to construct that was later dedicated to him. 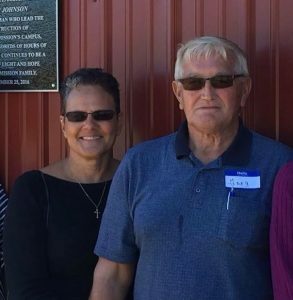 Gary Johnson and his wife, Shirley (above, left), next to the dedication plaque on the exterior of the arena. Gary Johnson of Springville will be among a dozen individuals, organizations and businesses honored at the ninth annual Blue Ribbon Gala hosted by Marley’s Mission at the Hilton Scranton Conference Center on Saturday, Feb. 16. Event proceeds will support the ongoing operations of the Mission, allowing services for children to be provided at no charge. 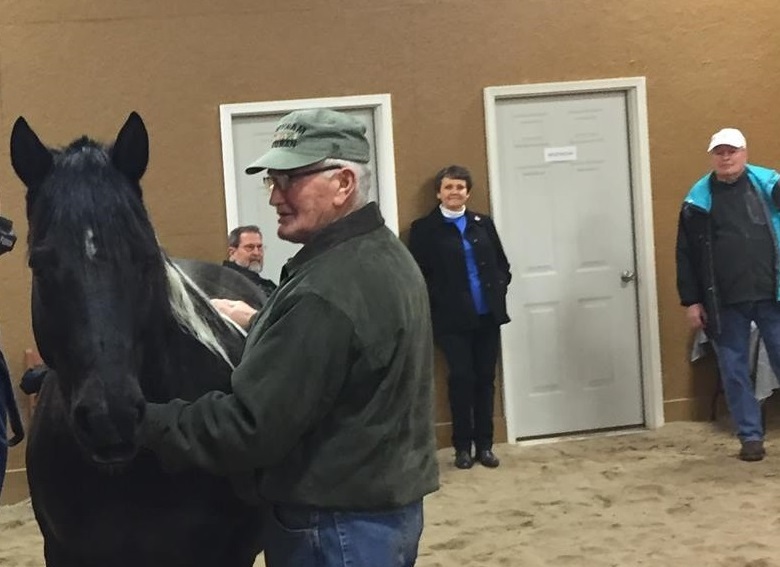 Marley’s Mission provides equine-assisted psychotherapy and healing for children who have suffered emotional trauma at a facility in Newton Township, near Clarks Summit. The Mission got it’s start near Lake Ariel in 2010 and made the move to its current 63-acre campus in 2013. Marley’s Mission was named after a pet guinea pig owned by a nine-year-old victim of a brutal assault. She had always wanted a horse, and when a horse was added to her therapy, an immediate recognizable change was observed. Equine-based therapy has been proven effective in re-engaging children who have endured tragedy or abuse that leads to depression and anxiety, helping them to regain confidence, self-efficacy, communication skills and trust. Unlike other programs, children brought to Marley’s Mission do not ride the horses. The unique treatment is conducted at ground level, helping children to develop their own solutions and overcome their emotional barriers. While the concept was simple enough, construction of a new facility in the course of a couple of months, however, almost overwhelmed Marley’s Mission founder and program director April Kemp. If not for the dedication and persistence of many volunteers, it could never have been done, Kemp maintains. Johnson has been in the construction business since 1972 and currently serves as the owner and manager of Unique Custom Building in Springville and Rainbow International of NEPA, which offers water, fire and smoke restoration services. Johnson oversaw the construction of an indoor arena, a 17-stall horse barn, an ADA-compliant pavilion with restrooms, as well as office and storage space. “He has become a fixture around here,” Kemp related, adding that Johnson’s years of experience translate to a unique vision and a welcoming personality. “He’s quick with a smile,” she stated. “He’s a very loving person, and it kind of radiates.” In September of 2016, the arena was dedicated to him. 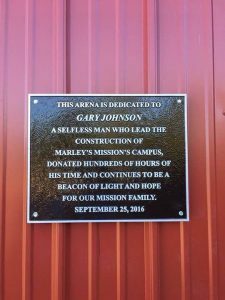 The thousands of hours that Johnson dedicated to Marley’s Mission as the leader of its Building and Grounds Committee and as the volunteer construction manager for the new campus has been an inspiration to Kemp and others associated with the organization. On Saturday, the Mission’s Board of Directors will honor Johnson with the first Rebecca Haggerty Reins of Healing Award at the Blue Ribbon Gala. Haggerty passed away in April 2018 after a long struggle with brain cancer. “She was the light of Marley’s Mission,” Kemp said of Haggerty. Johnson will attend the gala on Saturday with his wife, Shirley, and other family members, who are also involved with Marley’s Mission. He cites the true need for such a facility and the continued success of the program for his continued participation. “It’s constantly growing, so you know it’s working,” he stated. To learn more about Marley’s Mission, interested readers can log on to www.marleysmission.com.